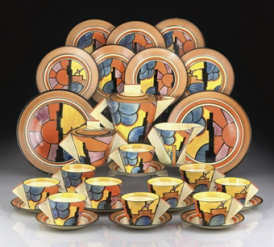 Clarice Cliff has become known as one of the great Art Deco designers. Along with others such as Rene Lalique for glassware, Erte for fashion design, and artist-jeweler Raynmond Templier, her designs have become classic for the period. Art Deco (Style Moderne) originated in the 1920s and developed into a major style in Western Europe and the US during the 1930s. (Features of the style include simple, clean shapes, often with a geometeric or stylised form of traditional shapes. The style reflected modernism for a fashion conscious 1930s). Clarice herself was born at the beginning of the Twentieth Century, and began an apprenticeship at the age of 16, for A.J.Wilkinson in their Burslem factory, having already received a basic training in pottery techniques. Clarice’s early artsistic endeavours had been encouraged by her aunt, who had been a potter herself. It was not until the Exposition Internationale des Arts Decoratifs et Industriales Modernes held in Paris in 1925, and a trip to France in 1927 by Clarice, that she began to produce her most striking designs. 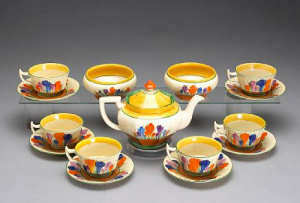 Her most famous work is probably her ‘Bizarre’ ware designed between 1928 and 1936. During this time she designed hundreds of pieces, and it was these designs along with her amazing series of patterns which have created the Art Deco masterpieces which are so popular today. The patterns used abstract, geometric and figural content such as ‘Deecia’, ‘Patina’, ‘Caprice’ and ‘Summerhouse’. These patterns were designed in brilliant, bold (and frequently clashing) colours of deep orange, yellow, blue and black. The forms of her wares followed the bold angularities and geometric constructions of Art Deco, with their triangular-shaped handles, arched lids and pronounced circular contours. The Age of Jazz figures (pictured left) have become one of the most famous of Clarice’s pieces are are seen as among the most important Art Deco pieces to come out of the potteries. The flat-sided figures of couples dancing the tango, and musicians were launched during the height of the depression and proved unpopular at the time. However, today, they are very sought after by collectors. The famous ‘Crocus’ pattern was designed in 1929 and became her signature design. Each flower in the Crocus was executed with a few skilful brush strokes. The design was very popular that teams of painters were needed to decorate it. These teams of painters became know as the ‘Bizarre’ girls. During this busy period she became artistic director for the company and also for the associated Newport Pottery Company. She was the first woman to achieve such a high position in the pottery industry. At the height of production there was over 60 people working on Cliff designs. The Illustrated London News of 1934 said that ‘A few well chosen pieces of Miss Clarice Cliff’s “Bizarre” ware seem just to add the last touch of distinction to a carefully thought out room.’ It was features like this that made Clarice Cliff a household name. 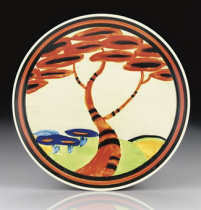 Today interest in Clarice Cliff pottery, and other designers of the period such as Susie Cooper, is widespread. Mint condition pieces can command very high prices, and the demand for seems set to continue. 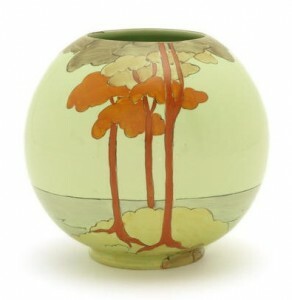 Pictured: Clarice Cliff ‘Coral Firs’ a Globe Vase, circa 1935 a black pen outline landscape scene with coral and brown fir trees, on a rare pale green ground 15cm high, with facsimile signature Sold for £687 at Bonhams, London, April 2012. 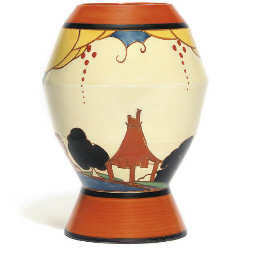 Clarice Cliff Patterns & Clarice Cliff Designs include: Bizarre, Crocus, Blue Crocus, Forest Glen, Windbells, Aurea, Summer House, Woodland, Pine Grove, Orange Autumn, Viscaria, Coral Firs, Orange Roof Cottage, Glendale and My Garden.